In this month’s featured app, we do a walkthrough of Shopify‘s own Bulk Discounts app. The app allows you to quickly create multiple discount codes in different sets, and import discount codes from third-party sites. You can use different sets of discount codes to differentiate simultaneously-active promotions on your store. You can configure a number of settings for each discount set, like start and end dates, types of discounts, number of uses per discount, and more. Plan promotions in advance by setting up start dates in the future. You can “Get” the Bulk Discounts app for free on your store. Once you have installed the app, click on the “Create one now!” or “New Discount Set” buttons to create your first set of discounts. Under the Generate discounts section, you can name the campaign (not visible to visitors), and set the number of times a discount code can be redeemed. Depending on the type of campaign, you can set a one-time-use code (most common for bulk discounts), specific number of uses, and unlimited uses for a single discount code. You can set the start and end dates of the campaign. 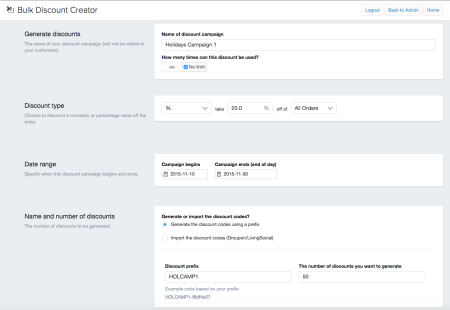 Select the “Generate the discount codes using a prefix” and type in your preferred prefix for the campaign. You can set the number of codes to be generated. For example, if you are providing the discount to the first 50 customers who order on your store, you can create 50 discount codes that you can send to those customers. Once you have configured the set, click on “Save Discount Set” to activate the discount codes on your store. Click on “Home” in the top menu to get an overview of all your discount sets. The Home view of the app gives you at-a-glance information about different discount sets and campaigns, including description of discount, usage, and date range. Click on a discount set to get information about individual discount codes within the campaign set. Here, you can see whether a discount code has been redeemed. 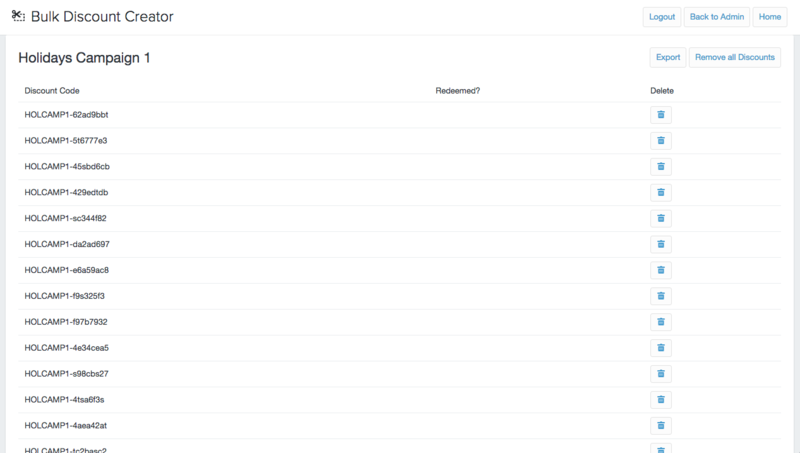 You can also delete specific or all discount codes, and export all codes into a CSV file. Learn more about setting up discounts in our tips on creating effective Shopify coupons post. 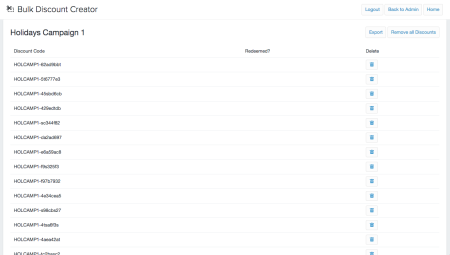 You can also visit the Bulk Discounts section in the Shopify Manual to learn more about the app. If you use online deal sites like Groupon or LivingSocial, the Bulk Discounts app lets you import the discount codes into your Shopify store. When you create a promotion on a site like Groupon, for example, you set the number of vouchers to offer customers. When a customer purchases a deal on Groupon, the customer receives a unique voucher code that they can redeem on your store. You will need to create the applicable discount on your store in order for the voucher to be redeemed. Here’s one scenario: you may create a promotion on Groupon for 50% off of all products on your store. You can limit the number of people who can purchase this deal on Groupon (to only 5 people, say). Groupon will send you a list of the exact voucher codes it will send to customers who purchase the deal. You can create a new discount set and set up the appropriate discount based on the deal. Instead of generating discount codes using a prefix, select the “Import the discount codes (Groupon/LivingSocial)” option. Then, enter each voucher code on a separate line. You can use a CSV file to separate each code into its own row to copy-paste in bulk. You can also set how long the promotion will be available. Note that, unless otherwise authorized by law, the purchase value should not expire even if the promotion expires. That is, if a customer purchases a 50%-discount deal worth $50, they can purchase an item of $100 value with the voucher while the promotion lasts. But, once the promotion expires, they can still use the voucher to put $50 towards a purchase on your store. Read more about voucher rules on the Groupon fine print guidelines. In such cases, you may have to create a new set of discounts for unredeemed vouchers. This set can have $50 off of an order, rather than 50% off. The Bulk Discounts app from Shopify simplifies the process of managing multiple discount codes in different sets. 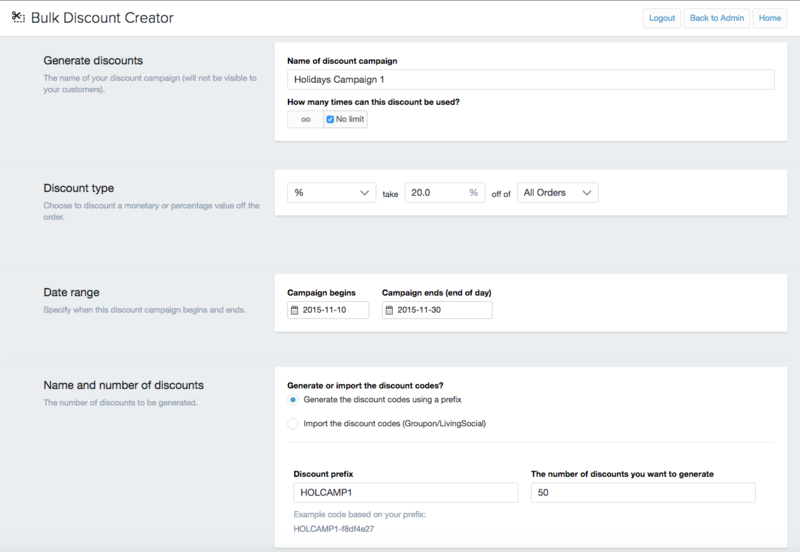 You can create a set of codes to differentiate promotions on your store. These discounts can be sent to multiple users, each with their unique code. If you use third-party sites like Groupon or LivingSocial to issue promotions, the Bulk Discounts app allows you to easily import codes generated by these sites. You don’t have to manually create a discount for each customer to redeem on your store. What are some other ways you have used the Bulk Discounts app? Tell us in the comments.